Does the bulb failure warning lamp on your XJS light up at you incessantly? Or perhaps you discovered a burned out marker bulb, but the warning lamp never came on? If so, you may have a failed Bulb Failure Module (BFM). In normal operation, when you first turn on your parking/marker lamps, the BFM will light for a few seconds, but should go out within about 10 seconds, depending on ambient temperature (it may take longer in severe cold weather). All it takes is ONE module to be operational in order for you to get the initial warning, so the fact that you get the initial warning merely confirms that the dash lamp is operational. A BFM is a small rectangular metal box with three terminals, which are input current (terminal "B", RED/SLATE or RED/ORANGE wire, left and right repectively), lamp output (terminal "L", RED or RED/BROWN wire, rear and forward respectively), and BFM warning output to dash (terminal "WL", to WHITE/SLATE wire). For easier identification, this is what a BFM looks like. The main case is about 37mm long by 18mm wide (approx 1.5 x .75 inches). The part number may differ, but the wiring and principle of operation should be the same. Internally, they're made of (something like) a bimetal strip which runs from the input (B) to the output (L), which initially (in the cooled position), rests against the warning terminal (WL), thus allowing current to reach the warning lamp circuit. As current flows through them for the lamp, the strip heats up and warps away from the warning terminal, disconnecting current from the output. If insufficient current runs through it (caused either by a failed bulb, an incorrect replacement part, or failed wiring after the BFM), then they don't heat up enough to do this, and the warning output remains on. Note that really brief intermittents won't necessarily be identified by the BFM, because the metal strip won't necessarily cool fast enough to contact the warning output, so a faulure of a BFM to identify an intermittent isn't necessarily indicative of a failed BFM. That is not to say that a properly spec'd BFM won't sense an intermittent. I'm going to assume that you're testing because either the dash warning won't go out, yet all bulbs appear to be working, or that the dash lamp isn't on even though a bulb has failed. In the latter case, properly replace the failed bulb before proceeding. Turn on your marker lamps. Remember that while working with the BFMs, that current is present, so apply proper handling procedures to wires. If the dash warning comes on briefly, you'll know that the dash bulb is operational. 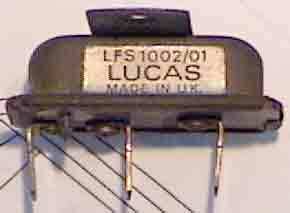 If not, it is unlikely that all four of the BFMs failed at once (well, this IS Lucas), so check and replace the dash warning bulb. If you have an intermittent BFM warning, it could be caused by a fault in the wiring to one of your marker lamps (after the BFM in question), or it could be a failing BFM (perhaps a loose bimetal element). Diagnosing this could be troublesome, but probably the easiest way to isolate it to a single BFM is to disconnect one BFM at a time and run the car for however many days it normally would take to experience an intermittent (I'll suspect running over a rough piece of road will bring out the gremlin). If you don't get the intermittent anymore, then you've isolated it. If you still get the intermittent, then reconnect the BFM and move to the next one. After isolating the BFM, to diagnose if it is a fault with the BFM, or a real intermittent, you'll need a spare BFM (can be exchanged with another location in the vehicle, just don't reconnect the BFM output lead on the suspect unit after relocating it). If the BFM warning goes away, then it is a bad BFM, replace. If the warning persists, then you have a wiring problem at that location, and the BFM in fact has been doing its job. Don't forget to reconnect the BFM output on the module if you swapped it to another location. In the boot, you'll find the BFMs crammed up on both sides near the boot lamps. The forward BFMs are located on the aux fuse panel (that'd be the PASSENGER side one) - one is to the left of the window thermal breaker (which itself is at the bottom right of the panel), and one is above it. The one above is a real b@&%! to get to, be forewarned. The brake light BFM is located under the ski slope, approx under the window switches. It has FIVE terminals ("WL" BFM warning output, "E" parking break switch (interrupts circuit ground when actuated), "B" (input) break switch (which DIRECTLY drives the third eye break lamp - if it fails, the BFM won't tell you), and individual outputs for left and right break lamps, both marked "L"). To check this unit without having to unburry it, pull up the parking break, and apply pressure to the break pedal. The bulb failure indicator should light up. If you release the parking break and apply the break, the indicator shouldn't light up (unless of course, there really IS a failure). There is another device, called the Bulb Check Unit noted in the electrical guide. 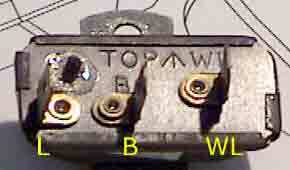 It is located on the main component (fuse) panel, second component from the top left. The electrical diagram doesn't give a good idea as to what this is supposed to provide a warning for, it is connected to ground, ignition, and both the break and parking break warning lamps. The tests here don't apply to this module. If someone happens across a description of what this component is supposed to do, please let me know. Since all marker lamps should be on at this point, either your BFM warning is on, or off. If you wanted to check your BFMs wholesale, disconnect the BFM warning outputs from the lot of them, and proceed on an individual basis. Since they're more likely to fail as a single unit, this is unnecessary - unless your cat just came to you from a relationship in which it was neglected, or you suspect as much. If you remove the BFM output from the module, that BFM won't contribute to the warning lamp state (having isolated that BFM from the warning lamp) - thus, if your problem is a warning even when all lamps are operational, removing the output from a suspect BFM should cause the warning lamp to turn off - that will quickly isolate which BFM is causing the warning state (well, as quickly as you might be able to access the BFMs themselves to do this), and will allow you to more quickly home in on the fault. Verify that the affected lamps are all of the proper wattage, or swap the BFM with another (already tested good) unit, and see if the problem follows it. If not, then the bulb wattages are suspect. If the problem relocates, then the BFM is shot, and should be replaced. Likewise, if you remove the lamp output connection from the BFM, the BFM should (if operating properly) trigger the warning output. So if you have a BFM you suspect of NOT warning you on failure (perhaps you just replaced a bulb because you saw that it was nonop), disconnect the lamp output, and if the warning lamp doesn't come on, this BFM is suspect. However, the wiring between this BFM and the warning lamp may be bad - take a voltmetre and check the voltage across the BFM output to ground. If battery level is present, the BFM is good, and you have a suspect wiring problem between here and the warning lamp.